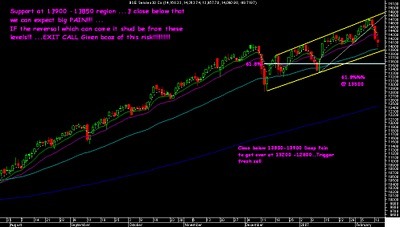 The Sensex is at top of channel and a fall below 144000 will open gates to 14050 and 13700-135000....Below that scary!!!!!!! 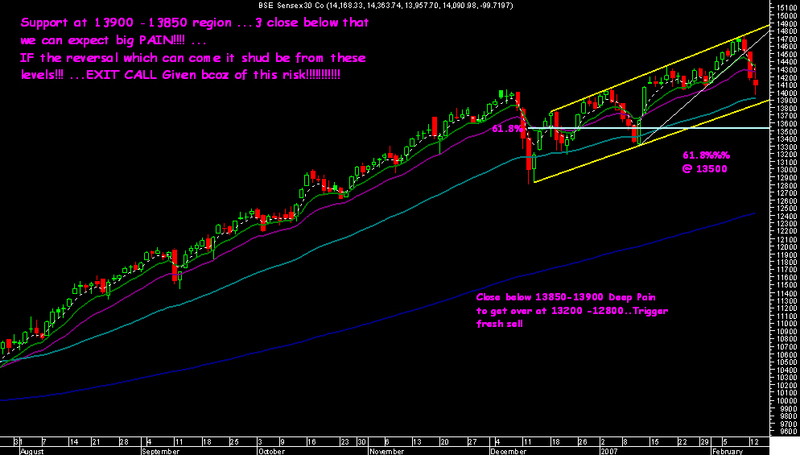 intermediate downtrend is if we stay below 13850-13900.... Targets possible on lower side is 13500.. Global Cues are very good so if we sustain 13850-13900 we can expect reversal from there ..
Our Long term view remains very bullish saying this frm 8000 levels still maintain our huge targets from that view .. So all guys reading newspapers and listening News Channels will sell Banks first thing in the morning and will be trapped as they may open too low to short ..!!!! the Gap down will be a trap ...Do you think somebody would be dumb to buy at yesterdays close after this news !!!!!!! Always FALL COMES BEFORE THE BAD NEWS !!!! VSNL ( cmp 413 ) .. Some Midcaps which u like the story can come in cheap now ...We would update the list only if we feel to messenger friends and on the chatBox so keep checking !!! !